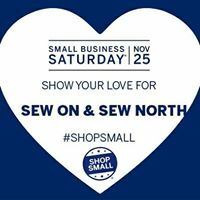 Sew On & Sew North Holiday Deals! ELNA sales: We will have price reductions on ALL of our ELNA machines. I cannot advertise prices but you will save additional $50-200 depending on model! Also, with some models you will receive a FREE gift!! Christmas fabrics, patterns, and kits will be 25% OFF Friday & Saturday! Can't shop this weekend? We also have "Deals After Dark", our LATE shopping night, Thursday, November 30 5pm-8pm. Check out the ad in Saturday's Republican or the posters around town for participating businesses. Also check out the #selfie #shoplangdon challenge for chances for more prizes. Friday, November 24 starts the Langdon Christmas Cash giveaways! We will begin handing out tickets for a chance to win Langdon Christmas Cash. The drawings are held on Saturdays: December 2, 9 & 16, and you must be present to win. See participating businesses for more details.